I happened to be @ Bozeman Toyota getting an oil change for my 2017 RAV4 (leased) and had seen an ad about the ‘all new’ RAV4... so while I was waiting, I asked Charlotte about the ad (she checked me in for my appointment). There was a 2019 RAV4 on the showroom floor, so we walked over to it and she started to show me some of the new features she was aware of; but for the full details, she introduced me to Brian. He invited to me sit at his desk so he could share the new features of the various models of the 2019 RAV4, but first, he asked me what I was looking for and how I used my current RAV4? I actually wanted a heated steering wheel and improved safety features in the event of a collision. Plus, I was interested in lowering my payments since my 2017 RAV4 was a hybrid and more expensive. We live 30 minutes from town and the hybrid suits a person that lives in the city because the electric portion of the engine kicks in at under 25 MPH. I drive more highway miles so I was not benefiting from the hybrid features. Since they were offering an Upgrade Program, I could trade my 2017 RAV4 in a year early on my lease. Brian zeroed in quickly on a model that would suit me better after listening to me. We went for a test drive and one of the features is the 2019 RAV4 has an 8-speed engine so it is more fuel efficient and the gear transition is definitely smoother. I noticed the door was considerably heavier than my 2017, and that is because of the steel reinforcing that is designed to send the energy of a collision up instead of in. Instead of an installed GPS, the 2019 has Apple CarPlay that syncs up with my iPhone. When we calculated the payments, I was saving nearly $20/month. Justin was involved in calculating the value of my 2017 and integral in helping to lower my payments. McKenzie patiently & deftly demonstrated the features of the 2019 and Chad, Hunter and Anthony helped guide me through the add-ons and the paperwork. It was lunchtime so Justin asked me if I was hungry and when I said, “Yes!”, he asked what I wanted and got it for me. Brian assisted me in transferring my belongs from the 2017 and I drove away as a very happy customer - thank you! Justin, the salesman, went out of his way to make the new car buying process go smoothly. He made sure that the elements that I wanted to be taken care of, such as switching my topper, were completed. Great place to buy a car ! Noah was great and the finance department was helpful and quick. I didn't feel pushed and they gave me a bit more for my trade-in than I expected. Thanks Guys!!! TJ and Chris at the rental desk were both kind and helpful. 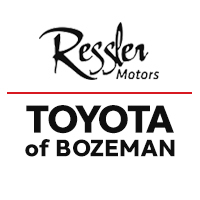 We rented for three weeks and were extremely happy with the vehicle and the service at Toyota of Bozeman.